Dharamshala: A new book documenting the “hardships of a Tibetan political prisoner under the Chinese government’s oppression and his efforts in highlighting the issue across the world” was launched here this morning. Speaking of his seventh book, Ven Bagdro recounted how he joined the peaceful protests led by monks of Gaden Monastery in Lhasa on 5 March 1988. He said calls for Tibet’s independence and return of Holiness the Dalai Lama to Tibet was brutally crushed by the Chinese government, and he along with many other monks were arrested and tormented in prison. He said he experienced untold suffering for a year in Gutsa prison and for two years in Drapchi prison until his release in 1991. 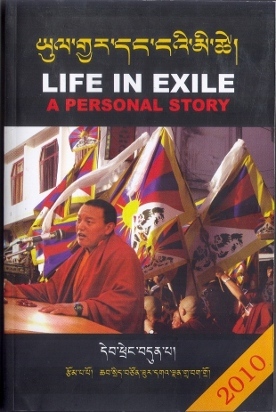 The book details the author’s “extensive visits to different parts of the world to garner support for the Tibetan cause”. It documents his “campaigns in France, England, the US, Italy, Germany, Canada, Australia and Sweden”. He said plans are afoot to visit the Netherlands and Belgium in July this year. The book depicts “pictures of peaceful protests by the monks of Gaden monastery in 1988 and torture weapons used by the Chinese authorities on Tibetan prisoners of conscience”. The book was released by Kalon Kesang Yangkyi Takla, Kalon for the Department of Information and International Relations. Kalon Takla hailed Ven Bagdro for his “resilience despite experiencing great suffering in Tibet”. “In exile Ven Bhakdro acted as the spokesperson of Tibetans living inside Tibet and made efforts to travel throughout the world to tell the real situation inside Tibet,” Kalon Takla said. Kalon Takla expressed “appreciation to Ven Bagdro for taking on the responsibility of spreading awareness on the Tibetan issue”.